Bischel factors in all three Red Knights goals. CHASKA, Minn. -- Charlie Bischel scored the first and last goal's of the game, and set up the middle goal as the Benilde-St. Margaret's junior varsity posted a 3-0 win at Chaska. Bischel's first goal came just three minutes, 33 seconds into the contest and, in the early going, the Red Knights dominated. Six minutes later, Bischel and Brady Giersten, who set up the first goal, swapped roles as Giertsen tallied on the power play with Bischel setting up the goal. Jonny Woodford, who assist on Giertsen's goal, registered the first assist on Bischel's goal at 11:11 of the second period, giving BSM a 3-0 lead and they would rely on defense and goaltending to do the rest. The Red Knights held a 30-10 advantage in shots on goal with Jack Olson, who picked up his fourth win of the season, and Cavan Slocum each making five saves in the shutout. Next up for BSM is a non-conference at Hill-Murray, Saturday. Game time is slated for 5:30 p.m. at Aldrich Arena. 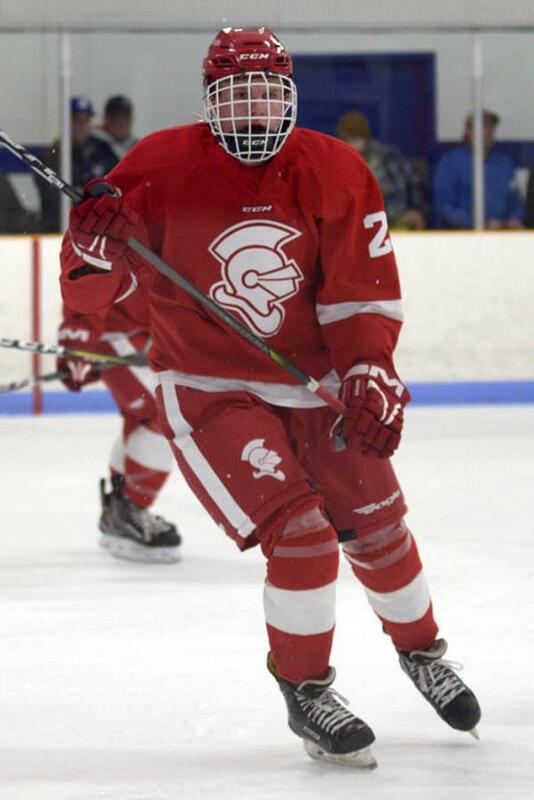 Brady Giertsen set up the game's first goal and scored the second for the Red Knights.